An anonymous buyer purchased at auction this week one of Jasper Johns’ famous Flag paintings for a shocking $28.6 million. Shocking, not for the price alone. Just last week, a Picasso painting sold for $106.5 million, nearly four times as much. Shocking, because of the quality and originality of the piece. Thirteen red and white alternating stripes, with a blue block, located in the upper right corner, adorned with 48 white stars. A standard issue American flag, before the Alaska and Hawaii Admission Acts, for $28 million, an unpardonable price for a work that will be produced en masse 100 times over in elementary schools throughout the country, between now and nap time. There’s no accounting for taste. This, I understand. 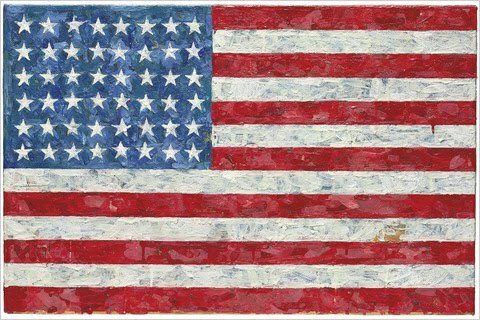 Johns’ Flag paintings, a 31-piece series, are widely considered the sine qua non of pop art. I get that, too. Yet, the purchase begs the question, which American flag, in whatever state of star-spangled-ness, is worth so much? The Betsy Ross Flag? Iwo Jima? The lunar flag? Consider this: For the same price, the buyer could have, as a guest of Space Adventures, orbited the earth, with anywhere between $5 and $8 million to spare, just enough to purchase, say, Sidney Kelly’s First-Class Marksman, or the publishing rights of Audrey Niffenegger’s second novel.